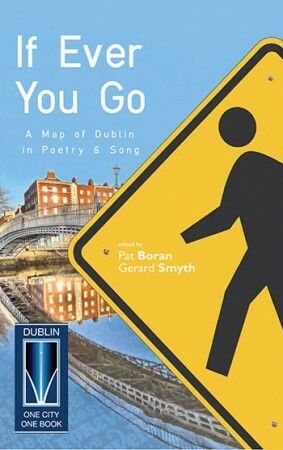 If Ever You Go: A Map of Dublin in Poetry and Song is a collection of poems, ballads and songs from a range of literary luminaries connected with Dublin. The book enables the reader to continually make new connections and discoveries on a virtual tour of the City of Words. Edited by Pat Boran and Gerard Smyth and published by Dedalus Press, If Ever You Go: A Map of Dublin in Poetry and Song is a unique volume of writing about Dublin, from early to modern times. It includes writing by both historical and contemporary figures, among them Swift, Synge, Yeats, Joyce, Kavanagh and Ó Direáin as well as Seamus Heaney, Eavan Boland, Dermot Bolger, Paula Meehan, Nuala Ní Dhomhnaill and Derek Mahon. There are songs and ballads from the city’s colonial past, verses by leaders of the 1916 Rising, and portraits of the modern city with its Spire and Luas tram, its Celtic Tiger ‘prosperity’ and its post-Celtic Tiger challenges. Pat Boran was born in Portlaoise in 1963 and has lived in Dublin since the mid 1980s. He has been Writer-in-Residence in a number of city institutions, is a former editor of Poetry Ireland Review, former presenter of The Enchanted Way and The Poetry Programme on RTÉ Radio 1, and is currently editor at Dedalus Press. He has published five collections of poems, most recentiy The Next Life (2007). His books have been translated into a number of languages. His porse works include A Short Histroy of Dublin (1999), the writers’ handbook The Portable Creative Writing Workshop (reissued, 2013) and the memoir The Invisible Prison: Scenes from an Irish Childhood (2009). He has published fiction for adults and children, and his children’s book All the Way from China (1998) was a finalist for the Bisto Book of the Year. He has edited almost 100 books of poetry including half a dozen previous anthologies, among them, with co-editor Peter Sirr, the audio CD Dublin15: Poems of the City (Irish Writers’ Centre, 1997) and, in 2011, Shine On, in support of those affected y mental ill health. His awards include the Patrick Kavanagh Award and the Lawrence O’Shaughnessy Award for Poetry. His is a member of Aosdána. Gerard Smyth was born in Dublin in 1951. He is a poet, critic and journalist. His poetry has appeared in publications in Ireland, Britain and the United States, as well as in translation, since the late 1960s when his first poems were published by David Marcus in the New Irish Writing Page of The Irish Press and by James Simmons in The Honest Ulsterman. New Writers’ Page published a limited edition small collection, The Flags Are Quiet, in 1969 and another limited, hand-printed edition, Twenty Poems in 1971, followed by Orchestra of Silence, a Tara Telephone publication, also in 1971. This early work also appeared in the Press’s celebrated journal The Lace Curtain. Smyth is the author of seven poetry collections, most recently The Mirror Tent (2007) and his volume of new and selected poems, The Fullness of Time, with an introduction by Thomas McCarthy, was published by Dedalus Press in 2010. For many years he was Managing Editor at The Irish Times and continues to contribute to that publication in the role of Poetry Editor. He is the 2012 recipient of the Lawrence O’Shaughnessy Award for Poetry and a member of Aosdána.